In a matter of weeks, Prime Minister Shinzo Abe will have to appoint the next governor of the Bank of Japan. It will be the key executive decision defining the future of Abenomics. When, five years ago, the then newly elected prime minister picked ex-Finance Ministry strongman Haruhiko Kuroda for the top BOJ job, the decision gave instant credibility to Abe’s economic policy ambitions. Today, for many economists, “Kurodanomics” is still the most visible and tangible driver of Abenomics. In my mind, there is little doubt that, on the basis of professional merit, Kuroda deserves another five years. 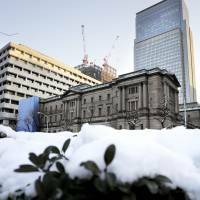 Since the 1960s, there has never been a BOJ governor asked to serve more than one term. Then again, there was only one prime minister in postwar history who was in power long enough to be able to reappoint a central bank chief who started under his rule (although he did not). It’s a historic moment for Abe, a unique opportunity to signal to the world that Japan has come full circle. After decades of political instability and policy uncertainty, Abe’s Japan has become a “bastion of stability” where policy is made by trusted leaders who are empowered to see their policy goals met. In the BOJ’s case, yes, Japan is out of deflation, but still nowhere near the 2 percent inflation target set by the incoming Kuroda five years ago. Make no mistake — there is more work to be done by the BOJ. Putting aside the intriguing question of “who,” here are some of the “what,” the substantive agenda items the next BOJ governor will face. The coordination between monetary policy and fiscal policy must continue to be seamless. Here, the next concrete macro-coordination challenge will come in October 2019. This is when the consumption tax is set to go up from the current 8 percent to 10 percent. The historic track record of tax hikes forcing a growth recession is three out of three. Add to this that, by later-summer 2019, fears of a classic Olympics-building boom-bust cycle are poised to become visible — typically, building and construction activity begins to slow down about one year before the games open. Clear speak: In 2019 to 2020, the BOJ and monetary policy will have to bear a greater burden to assure against a domestic economic downturn. On current policy settings and forecasts, we thus are set for a major conflict. The BOJ Policy Board and most private economists expect the 2 percent inflation target to come into sight sometime in mid- to late 2019. So just when the economy needs BOJ stimulus more than ever because of the tax hike and the Olympic boom-bust cycle, financial markets will fear that the BOJ will declare victory on the inflation target and begin hiking rates. Convincing markets that pro-growth support remains a top priority will become increasingly difficult. 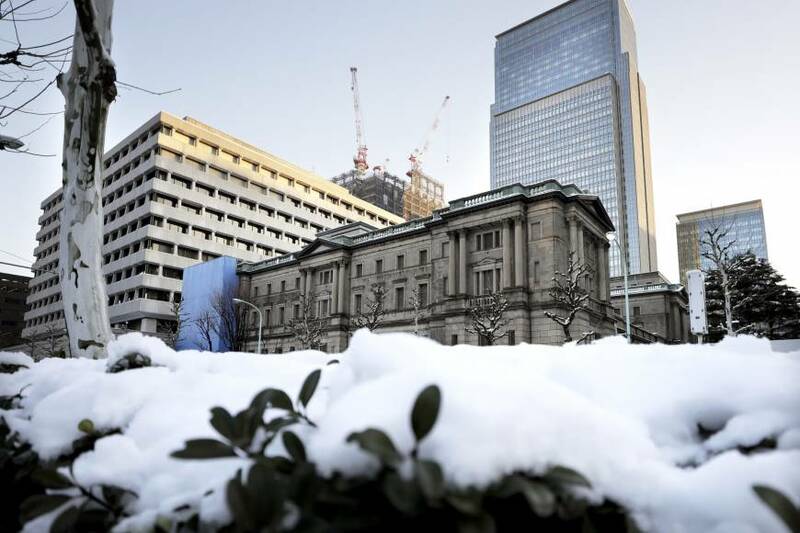 Communications policy and skill is poised to be challenged and, in practical terms, the BOJ may be forced to step up its buying of bonds again to fend off upward pressure on bond yields. A completely different challenge for the next governor comes from Japan’s domestic banking system in general and the regional banks in particular. Make no mistake — after merging from 21 money center banks into three mega-banks, Japan’s primary banking system is strong, well-capitalized and operationally viable. In contrast, the secondary banking is weak, fragmented and, in many cases, devoid of credible business models and franchise value. Many of the more than 100 regional banks will have to be consolidated. Many in financial markets fear this consolidation will cost the mega-banks — shotgun weddings with the authorities forcing healthy banks to take care of the weak regional cousins? Stranger things have happened. From an economist’s perspective, domestic Japan can become more productive and efficient only if domestic financial institutions become more productive and efficient at allocating capital. Reorganizing the secondary (regional) financial system is a herculean task facing the next BOJ governor. Managing this process without pushing regional economies into a credit crunch and without loss of confidence by local consumers will take not just negotiating skills and BOJ leadership but also political capital. Elections are won and lost in the regions. On the home front, another opportunity will be the BOJ’s potential leadership role for one of the most exciting areas of innovation and entrepreneurship at the moment, “fintech” (financial technology). Promoting an ecosystem that allows more innovation and encourages entrepreneurship is easier said than done, but the central bank can play a pivotal role. Supporting “regulatory sandbox” environments and incubators is one way. Actively connecting industry leaders with new fintech entrepreneurs is another. Globally, the race is on for a central bank to launch the first “fiat blockchain,” a blockchain-based settlement standard backed by the central bank. Japan’s mega-banks have done a great job getting ahead of the curve and have invested heavily in blockchain research and development. But to actually set the global standard and have a credible shot at becoming a truly global platform, Japan’s private banks will need the back-up and support from the central bank and the government. The next BOJ governor will either create the future of banking with such a project, or be forced to play catch-up to follow a possible Chinese (or South Korean) lead. Last but not least, the next BOJ governor will have to improve more systematically the credibility of the central bank’s policy target. In today’s world of relentless innovation, disruption and mega-competition, a simple inflation target may not make much sense any more. In the good old days before the technology revolution, an inflation target was like a speed limit for the economy — drive at over 2 percent and central bankers will hit the brake. Why? Because the rise in prices signaled that supply was short of demand, so the responsible move was to brake demand. Today, the combined forces of technological progress, entrepreneurial ambition and globalization have created more and more excess supply in many sectors and industries. The net result has been de facto loss of price power for many industries. Of course, this may just be a temporary issue, but, in a world where zero-cost scalability is likely to stay, it is fair to question the relevance of a price inflation target as the sole yardstick for central bank policy. Common sense suggests that an increasingly more complex world may require a more complex target. Practically speaking, every time the BOJ Policy Board pushes back and delays its forecast dates for when the inflation target is expected to be achieved, its credibility goes down. So far in the cycle, this “overpromising but underachieving” has worked to the BOJ’s advantage: by failing to hit the target, they had to try harder, which resulted in markets getting exactly what they want most, more free money. But what happens when you actually hit the targets? One elegant way out would be to change the target. Abe may have started to move in this direction when, two years ago, he began promoting his “nominal GDP of ¥600 trillion” target. Many economists, including myself, think this a highly constructive as well as practically feasible idea. We shall see whether the next BOJ governor will follow suit.